It's remarkable what a format change and a vigorous GM can do to bring back an event which just three years ago was all but dead to record participation levels this year. 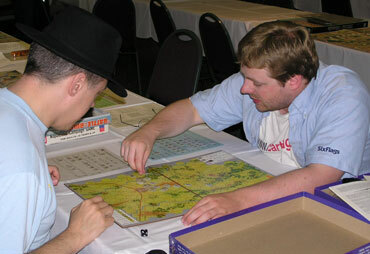 Grognardcon which gave Pre-Con attendees up to an extra three days of play allowed record attendance levels for many of the old hex wargames. 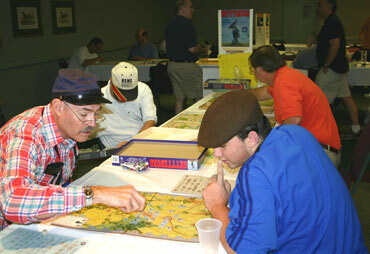 Ed Menzel of Fullerton, CA won the 2006 Gettysburg '88 tournament at the recently completed World Boardgaming Championships in Lancaster, PA. Ed, who was runner-up last year, finished with a 6-1 record and bested three-time champ Allen Kaplan (Howell, NJ, 5-1) in the Final. Allen had led all qualifiers in the preliminary rounds with a 4-0 mark. Boca Raton, FL's Greg Smith finished 3rd at 4-4, and Dave Zimmerman of Myerstown, PA (3-2) took 4th place. A record field of 33 turned out, and the 45-game total also was a new high. The Drozd family of Illinois squared off against the Richardson family of Virginia for the honor of most related entrants, but it ended in a draw, Rob, Ted, and Charlie Drozd tying Henry, Pat, and Tom Richardson. There were no Drozd-Richardson games to serve as tiebreakers. Preliminary games were played at the Grognardcon from Saturday through Tuesday, and at the WBC proper from Tuesday through Friday. Friday night, the 13 players (another new high) who had played the required minimum number of games (three) to qualify for the Final Four were ranked, with the top quartet advancing to the single-elimination rounds. They were, in order, Allen Kaplan (4-0), Ed Menzel (4-1), Greg Smith (4-3), and Dave Zimmerman (3-1). Ted Drozd of Chicago, IL (3-2) ended in 5th; he had the identical point score as Dave but lost on the basis of the head-to-head tiebreaker. The sixth and last player to win three games was your Gamemaster (5-2). 7th through 10th places were achieved by Doug Porterfield, Bob Jamelli, Lance Roberts, and Charles Phillips, respectively. The semi-finals and Final took place on Saturday. The semis matched #1 Allen Kaplan against #4 Dave Zimmerman and #2 Ed Menzel against #3 Greg Smith. When the GM attempted to rearrange the pairings to avoid rematches, Allen told him, "Don't bother. I've already played all three of them." Indeed he had; and he modestly didn't say that he had defeated each of his fellow semi-finalists in the preliminary rounds! It's an impressive feat that will be difficult to replicate in future years. Allen took the Confederates for a bid of 3 yet still managed a July 1 knockout of Dave's Union forces; the unadjusted POC was 22-8 at the end of Turn 8 and the final, adjusted score 22-11. Meanwhile, Greg took the South for a bid of 4.5, the tournament's highest, against Ed. The North whittled away at the South's infantry steadily, and eventually the Rebels conceded on Turn 15 with all but two of their infantry units eliminated or flipped. The Kaplan-Menzel Final rematched a preliminary contest in which Allen's Union forces prevailed, the only Menzel loss of the tourney as it turned out. The sides switched this time, with Allen taking the South for a 3.0 bid. Union strength showed early, repulsing two Confederate attempts at Culp's Hill and inflicting a 2-step loss during a Rebel attack on Cemetery Hill. The latter resulted in the South passing the chit to the Union and taking Cemetery Hill on the reroll. But during the Union turn the Blue retook the hill and cracked the first Grey infantry stack. The Union withdrew from Culp's and Cemetery Hills to set up deeper defensive positions during Turn 8. On July 2, numerous attacks on the first two turns eliminated smaller units on both sides, but the Union could better afford the attrition. The Union would not return the chit even when the dice went against them, which paid off when the CSA took double infantry step losses on Turns 11 and 12, with the USA retaking Cemetery Hill. With their losses too steep at that point, the Confederates surrendered. Congratulations, 2006 champion Ed Menzel! Doug Porterfield's 7th place finish garnered him Rookie of the Year honors. Your GM managed Best Confederate Player with a 4-0 log, slightly better than Ed Menzel's 4-1 and Allen Kaplan's 3-1. Greg Smith took Best Union Player laurels at 3-1, a year after he turned in an 0-4 scorecard as the Federals. Greg was the only competitor to take three contests as the Union; Ed Menzel and Allen Kaplan each finished 2-0. No wrapup would be complete without a few stats. As mentioned, we played 45 games, including the semi-finals and Fnal, the most ever for a Gettysburg tournament. 38 games were played using the campaign (3-day) scenario, while seven used the July 1/first day only scenario. In total, there was a bid in 25 of the 45 games: 1 for the Union and 24 for the Confederates (ranging from 1.0 to 4.5 Victory Points). The South won 26 of this year's contests to the North's 19, but this apparent increase in play balance is less than it appears. The seven July 1 games were all won by the Union, which means that the Confederate-Union split on the 38 campaign games was 26-12. Going back and looking at '2005's games, I found that the Union won six of the eight July 1 games and the sole July 2/3 game. So, the Confederates' record in campaign games was 23-4-1 in 2005. Delving a little further, this year the South's margin in campaign games with a Union bid or no bid was 11-4; in games with Confederate bids, the differential was 15-7. There's always more to bidding than just which side has the advantage; your side preference, your tolerance for bidding in general, and your opponent's preference all could contribute to your bidding posture. Having said that, I've been reluctant to opine on what a "good" bid is. But on the basis of the one PBeM and three FTF tournaments for which we now have complete records, I'm prepared to editorialize that bids need to be higher for the Rebels than they have been, unless Union strategy and tactics improve. Even in games where the South bid 3.0, they still won nine of 12 contests. apparently had the week's highest score, 67-53! And if Chuck and I had played Turn 23, there could have been even more dead units. Don't complain about your bad dice until you've tried Bill Thomson's handicap. After he lost one particular game, the next players using the same board discovered that Bill had used an 8-sided die his whole game! "Not only didn't I roll any 9s or 10s, I didn't roll any 8s in that game, either," was Bill's philosophical reaction to the news. After scoring five wins against top-flight opponents, Allen Kaplan is the new Gettysburg '88 AREA leader at 6202. Bruno Sinigaglio deserves huge thanks not just from me but from everybody who played Gettysburg at Grognardcon from Saturday, July 29 through Tuesday, August 2. Not only did he run about eight events all by himself, but even when Grognardcon ended, he continued to help out the rest of the week. Bruno's Grognardcon is a major reason why we set records in attendance and games played this year. I want to also thank our Assistant GMs, Greg Smith, Ted Drozd, and Ed Menzel, for their help in running the tournament. Ted was the lone ranger running things on Thursday. Greg also was willing to, and did, play pretty much anybody all week (even if it meant having to teach them the game), whether or not that matchup helped his own competitive position. And he still made the playoffs! Dave Zimmerman deserves a shout out for remembering that, fivr years ago, Allen Kaplan lost his Hood counter, and locating an extra such counter to give to Allen. Thanks also to all of you who went out of your way to get in a game or two. You know who you are! If you see an alleged novice player show up wearing a Union reenactor's cap, head the other way. Albert Bowie arrived late in the week, attired in said cap, asked to be taught the game, and proceeded to crush two opponents in a row as the Blue! But instead of trying for a third win and playoff eligibility, he vanished as quickly as he arrived, declining the GM's request to provide a street address or e-mail. Maybe he'll be back in 2007. Dave Zimmerman has entered 12 Gettysburg '88 events at the WBC and Avaloncon, finishing in the top fivr at least nine times - without winning! One of these days, Dave, it will be your turn for sure. Ted Drozd seems to be following in Dave's footsteps, with five top five finishes in five tournaments entered, but no firsts - yet. Our champion, Ed Menzel (AKA The Menzelator) had quite a WBC. In addition to winning Gettysburg, Ed also topped the field in Victory in the Pacific, and finished third in War At Sea. I don't think anybody beat him in Afrika Korps, either, although he didn't play enough to qualify for that event's playoffs. After Ed won VIP, I put my foot in my mouth by questioning his choice of GBG as his team game instead of VIP. So then he went and won Gettysburg, too! Obviously he still had plenty of wins in him! After a year of record participation, it's hard to argue that we weren't overwhelmingly successful. Since Gettysburg made the WBC Century with 37 games last year, I would hope that 45 games this year will keep us in the Century. I'm hopeful that Grognardcon will continue. The format changes we made this year appear to have worked out well. Everyone seems to have adjusted to banning Confederate withdrawals without difficulty. Adding a Union automatic victory condition on July 2 apparently had no impact as it was never invoked. If you have thoughts on format or other adjustments, please let me know. Otherwise, I'll be very inclined to keep things as they were this year. Please note that if BPA rules stay the same, I will not be able to GM Gettysburg next year if anyone else wants it, inasmuch as it would be my second GM game (after War At Sea). I'm still willing to GM it, but from now until March 1, 2007 if you want it you have first dibs. If I do GM the event, I will need the help of Assistant GMs, preferably more than one, and especially on Thursday, just as I did this year.